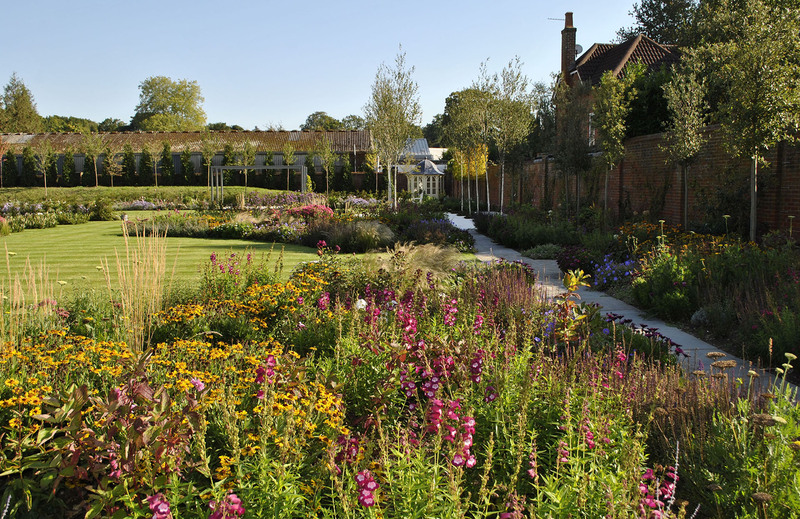 The owners of this stunning period property wanted a classic garden to compliment the house, with a formal layout and soft romantic planting which would bring interest through all the seasons. The design was all about creating an extension of the family home. Large sliding doors opened up from the new extension and kitchen, so we designed a generous paved terrace and a fire pit for hosting their friends and eating outdoors in the summer. Evergreen hedging and a level change keeps the pool area deliberately separate from the rest of the garden in order to create intimacy and seclusion in such a large garden. 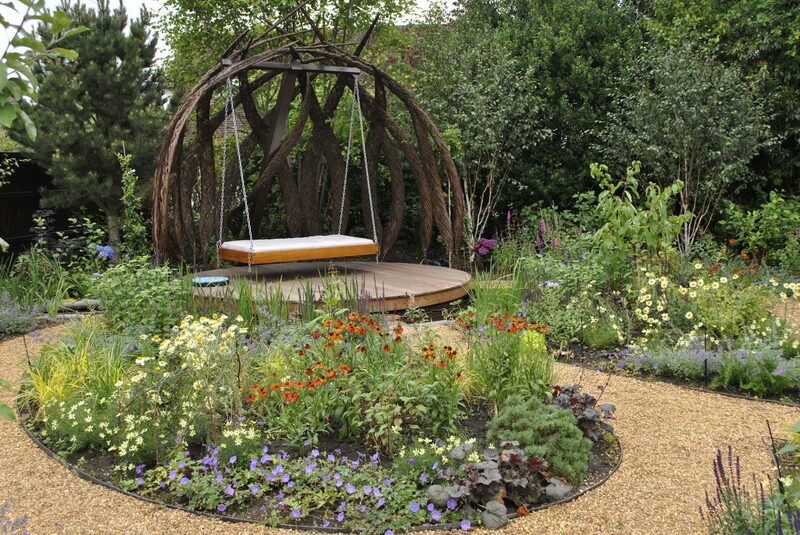 Strong structure gives interest throughout the year and tree planting draws the eye and encourages exploration to the pool areas. 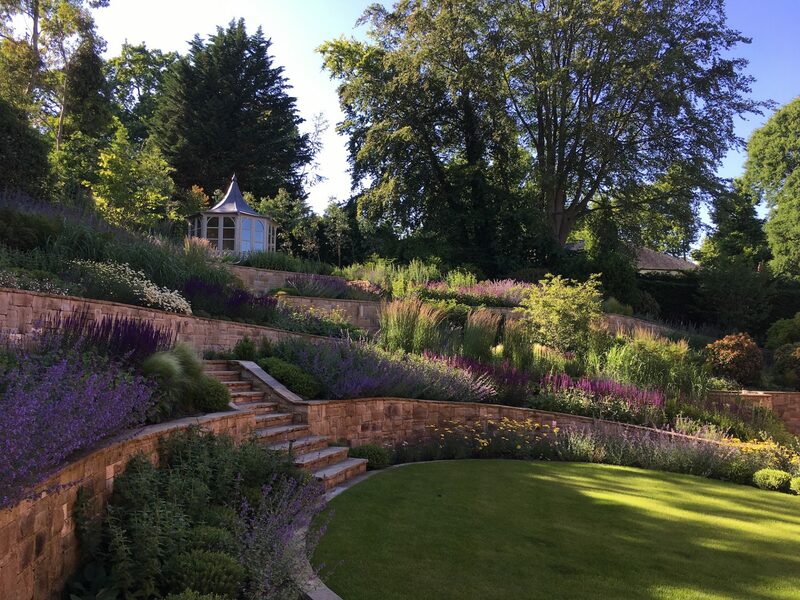 A more contemporary sawn sandstone is used around the pool and this combined with blocks of grasses studded with brightly coloured perennials catches the evening sun. A new Pool house was also installed with lead roof to compliment lead detailing in the original house. 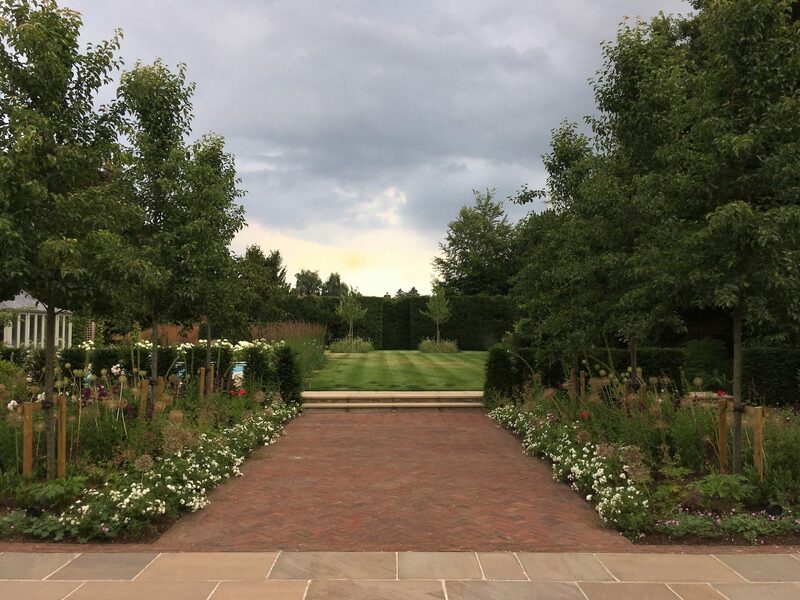 The once abandoned tennis court was renovated and this area of the garden was completely redesigned to incorporate sweeping curves of native hedging and gravel paths through orchard and meadow. In the front garden the existing beautiful brick paths were restored and a new wider driveway added to give the parking space which was needed. 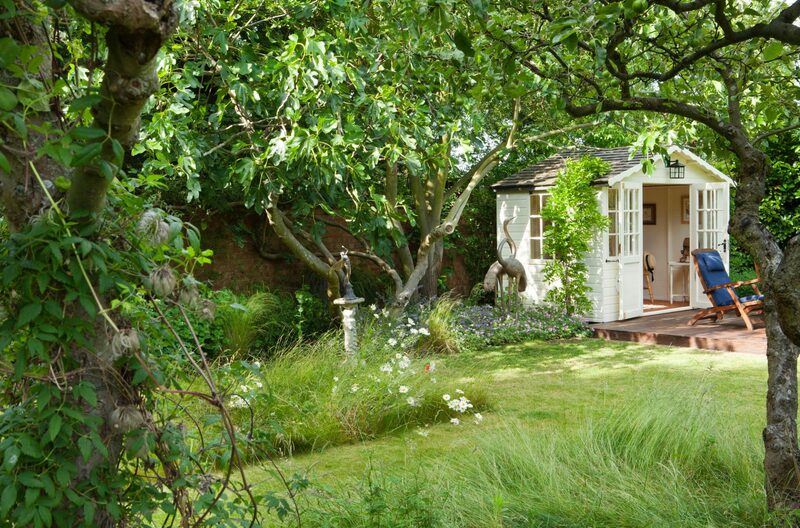 A hidden turning area has been created by installing a grid under part of the lawn. 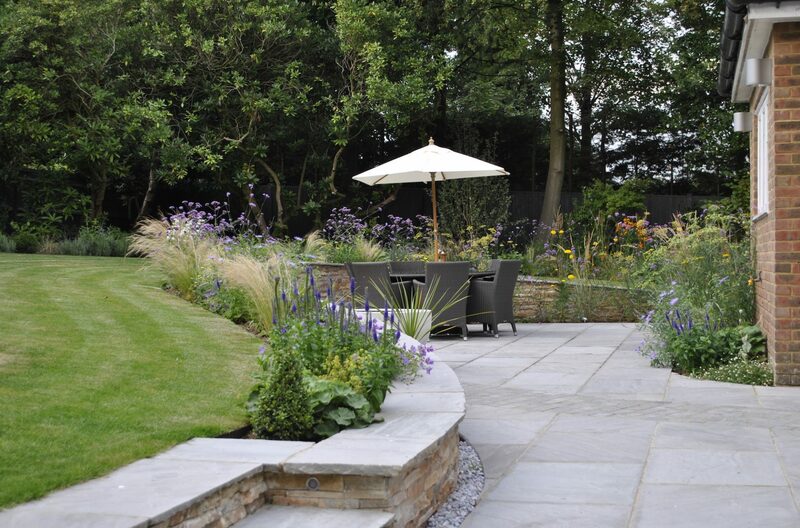 Formal planting in the front using many evergreen plants create a smart all year round look which is softened with seasonal flowers to create a changing patchwork of planting. 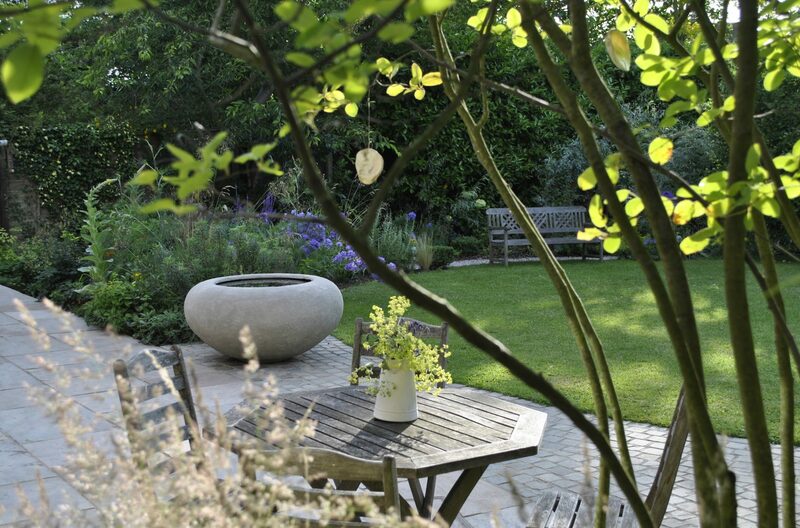 Soft lighting means that the garden can be enjoyed in the evening and throughout the winter months too.